Have you ever heard a song or sound from a certain time or place in your life, and been instantly transported? When I was in the 5th grade CD players were brand new, and I was thrilled beyond measure to receive one for Christmas. With this new CD player came 3 CDs: an instrumental guitar sampler, “Rubber Soul” by The Beatles, and “The Best of The Mamas & the Papas.” The oldies station on the radio was my favorite, so my parents had chosen music they knew I would love. I played those CDs nearly to pieces! I had one of them playing whenever I was in my room, whether I was reading, playing with friends, studying or even sleeping. So it makes sense that recently when I heard the-oh-so familiar strains of “California Dreamin’ ” by The Mamas & the Papas, I experienced a startling rush of emotions. I felt like I was 11 again! I remembered how it felt to be sitting on my twin bed, listening to the voices of my parents and siblings. I felt safe and content. I could even smell the way my bedroom had smelled, particularly the scent of my books, my drawing pastels, and laundry detergent. The experience was a reminder of what a wonderful childhood I had, and it really struck me how intense these recollections were. During class we always begin with the “Hello Song” and end with the “Goodbye, So Long, Farewell” song. Part of the reason we do this is because of the musical memory that we are building by singing these ritual songs. When we sing the “Hello Song” together, we are preparing to begin, we are getting excited and warming up our voices. Scientific research shows that our brains are hard-wired to connect music with memory. Even for those who are experiencing dementia or suffering from Alzheimer’s, music can bring up deep emotional recall. There are studies that show familiar music calming brain activity and enabling the listeners to focus on the present moment. Singing the same songs to begin and end every class allows our children to experience a time of beginning and preparation with “Hello” and a natural ending with “Goodbye”. This is also why singing goodbye to instruments, scarves, and other classroom props is so powerful! 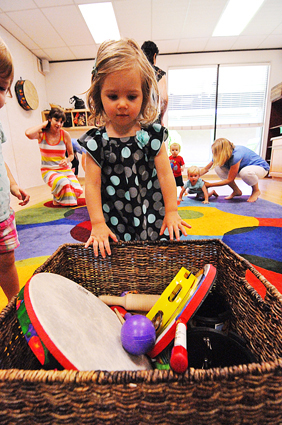 The musical memory of those two notes, “good-bye”, are ingrained in the children’s brains. Try singing goodbye to things at home to indicate an end to playtime (good-bye toys! ), people (good-bye grandma!) or even TV time (good-bye Nickelodeon!). You may find that it is easier for your child to give up their favorite toy, not only because you have transformed saying goodbye into an activity by singing, but also because you have tapped in to that musical memory of saying goodbye in a safe and fun way.